Recently, I’ve talked at events on the subject of how higher education institutions can begin to think about Tag Manager as a strategic asset in their digital strategy plans. Below you’ll find a number of things, including audio/video of my talk (once it’s available), presentation slides, and links to many of the resources I mentioned. Google offers an extremely good tutorial series that will guide you through the initial setup and creation of your first tags. It doesn’t take long to go through the lessons, and they give you a good handle of the basics that will lead you into doing more complex things. LunaMetrics is a Google Analytics consulting firm that maintains a pretty up to date and comprehensive series of posts that include tutorials on Google Tag Manager, with an emphasis on how it integrates with Google Analytics. They also offer a library of preconstructed tags that you can download and import into an existing container (notwithstanding tweaks you need to make to have it be correct for you specific use case). Simo is a Google Developer Expert and senior data advocate at Reaktor. Dude’s crazy smart. And while he blogs about many topics surrounding data, he’s also one of the foremost bloggers on Google Tag Manager. His blog has a wealth of posts and tutorials explaining how to accomplish all kinds of different tasks using Google Tag Manager. Like the title states, this is just a crap ton of GTM stuff of all varieties, sorted and linked for whatever you need. This should keep you busy for quite a while. Tag Manager Strategy: One Container or Many? You can find the JSON file for the examples shown at my talk at OUTC17 that you can import into your own container in this Gist: https://gist.github.com/thequicksilver/9a3ea1d6af944c04e399a4613062840c. This export file contains the pageview tags with audience custom dimensions and variables, form abandonment, and menu tracking cases. If you need help importing a container, follow these instructions. This setup will allow you to track the previous and next clicks on a page’s slideshow. Setup with your slideshow will vary somewhat depending on the library or code you use to employ the slideshow, but the basic principle should be the same regardless. This functionality requires a tag and trigger (obviously), a variable for the slide name, and a dataLayer event. 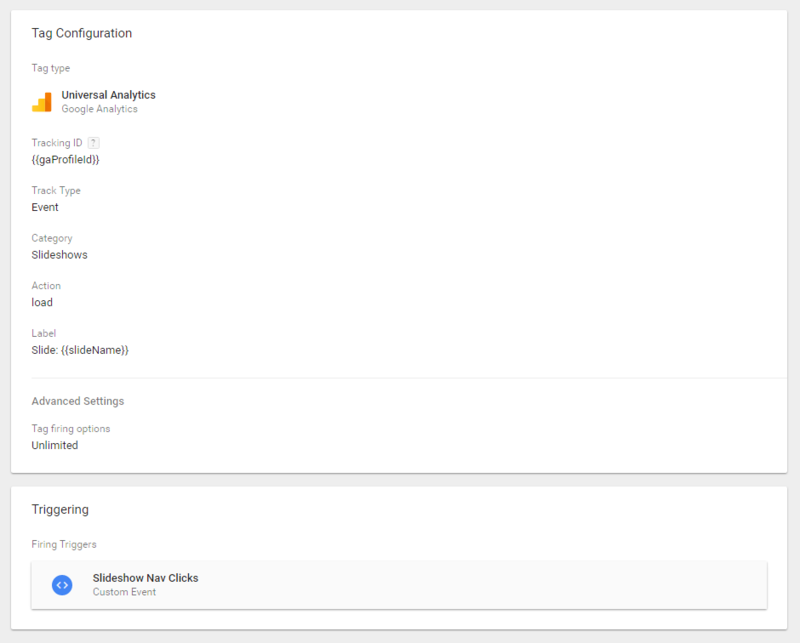 The tag is based on the integrated Google Analytics type, which gives us access to it’s configuration options without any extra work. We use a previously defined variable (a lookup table) called gaProfileId that gives the tag the GA profile to route the data to. We then tell it we want this Track Type to be an event (rather than a pageview or other option). We then set the Category and Action of the analytics event to a plaintext string that will be consistent. The Label brings back our slideName variable from earlier, which you can see being concatenated with the prefix “Slide: “, which will result in labels like “Slide: Your Slide’s Title”. We also allow the tag to fire an unlimited number of times, since we know there’s no limit to how many times people can click through slides. Next: Next post: Tag Manager Strategy: One Container or Many?